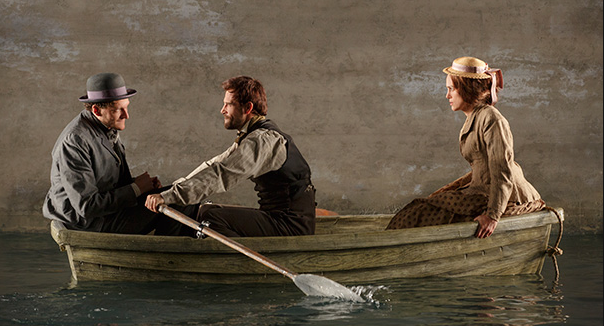 Thérèse Raquin is a woman of few words, but definitely A Presence. At least, she is in Helen Edmundson’s adaptation of Émile Zola’s 1867 novel, Thérèse Raquin – and as embodied by Keira Knightley. The play still feels fresh, but it is odd – part naturalistic study, part social and psychological critique, part overwrought love story, and part crime thriller (a precursor to the work of Théâtre du Grand-Guignol). So it’s probably no surprise that some aspects of director Evan Cabnet’s earnest, occasionally gripping, but ultimately unpersuasive revival work better than others. Let’s start with the show’s likely raison d’être – Knightley herself. She is in any number of ways an outsider. Her bona fides as a movie star, for one – also her stunning appearance. Even in Jane Greenwood’s deliberately drab costumes, and unflatteringly coiffed, nothing can disguise the ravishingly perfect planes of Knightley’s face. Yet there’s a disconcerting aspect to her beauty. Maybe it’s the deep-set eyes, not always easy to read under theatrical lighting? Or a downward turn to the full lips? In any case, the point is that while Knightley is always gorgeous, she also looks dejected, morose, sulky. But here, she’s so much the outsider, she might almost be in another play. Cabnet consistently places Thérèse outside the visual frame – but because she’s Keira Knightley, we can’t take our eyes off her. And that’s another problem – Thérèse’s tragedy is linked to her ordinariness – we need to believe, as she does, that Laurent is her only way out of a bad situation. Anyone who looks like Knightley would never be out of options. The bigger issue though, is a lack of chemistry between her and her lover, Laurent, played by the hunky but (here, at least) charisma-free Matt Ryan. There’s no visible charge at all between Ryan and Knightley – her outsider-ness exacerbates the lack of connection. And without it, the center of the play doesn’t hold. There are fine supporting performances – notably by Judith Light as Madame Raquin, and Gabriel Ebert as the drip of a husband – but it’s not enough. What the Roundabout production does have is some strikingly beautiful visuals, especially in the early part of the play – an airy, painterly world that suggests pre-impressionist art. Later, the scenes set in Paris are far gloomier, recalling Degas’ painting that’s thought to be based on Thérèse Raquin. 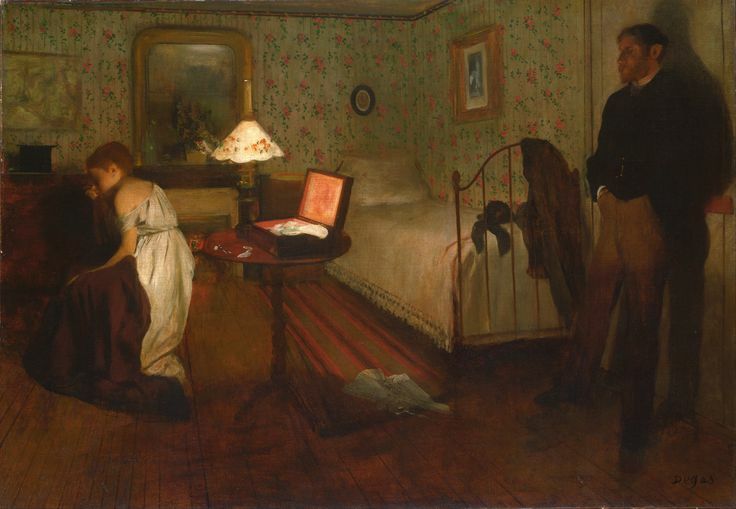 Edgar Degas’ painting of Thérèse Raquin. 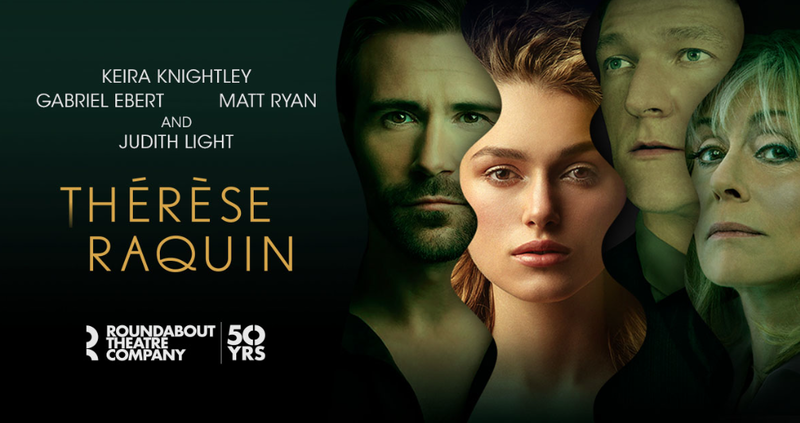 It’s all very evocative – but on the other hand, the scary parts, which for me are among the most intriguing aspects of Thérèse Raquin, go almost unmarked. Cabnet does make something of the famous murder scene – there’s plenty of real water – but somehow it doesn’t grab us by the throat as it should. Likewise, Thérèse’s apparitions can be thrillingly theatrical, but here are undercooked. Cabnet seems to be trying simultaneously to give Thérèse Raquin a faithful, melodrama-style production – and to deconstruct it. I’m not sure that’s desirable, or even possible – but it does give set designer Beowulf Boritt a couple of opportunities, which he grabs with breathtaking style. One is Laurent’s gloomy garret apartment, which seems to hang in the middle of nowhere, surrounded by an fantastically colored sky, utterly at odds with the grim interior – it’s a scene which captures both the passionate dreams around the Thérèse / Laurent relationship, and its tawdry reality. The second – even better – I probably shouldn’t reveal, since it’s a coup de théâtre. I’ll just say that it’s another instance where Thérèse’s fantasy life is on a collision course with what’s really happening to her. In these images, the fundamental essence of the play made thrillingly visual. If only there were more moments like them! You must have gone the first night of the previews. Thanks for the review. You even scooped Bernard. I’m going Dec. 12. Haven’t found anybody to go with me yet. It’s too grim. I just read the novel for the first time and couldn’t believe the plot.